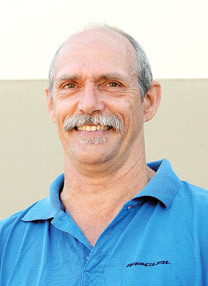 2007 Pride of Australia ‘Role Model’ medal winner, Brenton Pedler, a long time Territorian and father of three said, “When I found out I was nominated for the award I was thrilled, but to actually win, that totally took me by surprise”. Brenton is a member of the Alternative Education Provisions Team (AEP), which was formed in 2004 under the guidance of program manager Ross Macandrew. Many of the young people and their families involved with AEP have endured years of hardship, or have multiple barriers which prevent them from having what you and I take for granted, and if not supported they would more than likely end up continuing to live on the fringe of society. For years, Brenton has worked closely with these young people, assisting them to realise and achieve their educational, career and life goals. As Brenton reflects back, he remembers all the people who have helped him to help others. “A lot of Charles Darwin University Staff have been very helpful, Scott and Leyland from Horticulture, Pudd (Warren) from Metals & Engineering, Shirley and Oliver from Hospitality, Howard from Electrotechnology, Audrey Tate from Conservation & Land Management, Bev Luke from Business and Bill Adams, Sport and Recreation just to name a few”. “CDU SchoolsLink has been a valuable ‘first point of contact’ for my enquiries and it has always led me to lecturers who have provided my clients with realistic and achievable study options. To those young people that really commit to their studies it has been a new beginning”. “Over the years quite a few of my clients have successfully completed VET courses at CDU, this has either lead them to employment outcomes or further study options”, Brenton said. If you are a young person looking for study options please contact CDU Info Shop on 8946 7766 or email careers@cdu.edu.au or alternatively SchoolsLink on 8946 6387.